The association Marseille Accueil Culture et Tradition (MACT) was founded in 2000 by four nautic clubs of the Vieux-Port of Marseilles, Club Nautique Phocéen & Chambre Syndicale des Pêcheurs Professionnels - Association des Pêcheurs Professionnels du Vieux-Port (CNP-CSPP-APPVP), Syndicat Libre des Patrons Pêcheurs (SLPP), Syndicat des Pêcheurs et Plaisanciers de Rive Neuve (SPPRN) and Syndicat des Pêcheurs de Saint-Jean (SPSJ). The four clubs, among the oldest in Marseilles and, originally, fishers' associations, manage 12 floating wharfs (pannes) with 462 mooring slots, that is 15% of the capacity of the Vieux-Port. Membership is 650, made of 35 traditional fishers and the rest of yachtmen. The goal of the association is to manage collectively the equipment conceded to the clubs and to preserve the "mixing" of fishers and yachtmen in the clubs. MACT was created as a reaction against the management of the Vieux-Port by the Marseille-Provence-Métropole (MPM) Urban Authority, which aims at grouping the clubs into a "delegation of public service" (DSP) called Pêche et Nature du Vieux-Port de Marseille. MACT believes that MPM promotes a not-so-hidden agenda, favouring the prestigious yacht clubs and trying to get rid of the traditional, smaller clubs, which maintain the traditions and foloklore of the Vieux-Port but have a much lesser economical "significance". Accordingly, MACT actively campaigned the other yacht clubs not to sign the management agreement with MPM, which started a still ongoing legal issue. On 15 December 2005, MPM unilaterally terminated the concession granted to the fours members' club of MACT. In January 2007, MACT required in court the cancellation of the allocation of the DSP by MPM to only two yach -clubs. At the same time, MPM required MACT to stop "obstructing the management of the Vieux-Port by MPM" and "managing anything in the Vieux-Port"; they also required MACT "to remove any emblem or flag bearing the MACT emblem on goods depending on the public domain managed by MPM". The Court ordered MACT "to stop its illegal activities in the Vieux-Port" but rejected the others claim of MPM. In spring 2009, the clubs were still located on the Vieux-Port, with their flag flying. This case highlights the traditional rivalry between the two "sides" of the Vieux-Port, the "rich" one, with prestigious yacht clubs, and the "poor" one, with smaller clubs descending of traditional fishers' syndicates. More generally, it highlights the trend, not specific to the Mediterranean Sea but particularly strong there, to increase the size of marinas to house even bigger leisure boats, and to expell smaller, traditional boats deemed economically "unuseful", if not "parasitic". MACT has gained significant support in Marseilles, several inhabitants refusing to see "their" Vieux-Port transformed into a billionaires' marina. 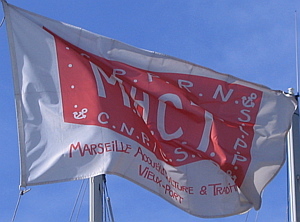 The flag of MACT is made of the rectangular logo of the association with a white border, including below the rectangle the writing "MARSEILLE ACCUEIL CULTURE & TRADITION / VIEUX-PORT" in orange letters. - "S.P.S .J " (left). Oddly enough, some flags (as on the photo shown above) lacked "S.P.S.J. ", only the white dots being shown in the left part of the orange rectangle. Groupement des Sociétés Nautiques des Quais du Vieux-Port is a yacht clubs' association based in the Vieux-Port of Marseilles. I have not been able to find more information on the association, but its flag is usually associated with the flag of Marseille Provence Métropole (MPM), the institution in charge of the management of the Vieux-Port; therefore, I believe that it could be the association of the yacht clubs "loyal" to MPM, that is, which have signed a management contract with MPM. 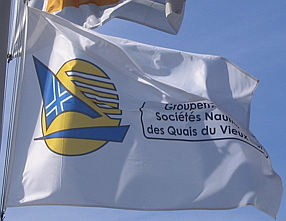 The flag of Groupement des Sociétés Nautiques des Quais du Vieux-Port is white with the association's logo, flanked on its right by the name of the association, written as "Groupement des / Sociétés Nautiques / des Quais du Vieux Port" in black letters, placed in a rectangular cartouche with rounded angles, outlined in black. The logo of Groupement des Sociétés Nautiques des Quais du Vieux-Port is made of a stylized blue sailing boat, with the cross of Marseilles fimbriated in white on the sail, placed in fronf of a yellow sun partially cut by five horizontal white stripes. These stripes could represent the floating wharfs of the Vieux-Port. This list is not a comprehensive list of Marseilles yacht clubs but only an index of those for which flag-related information is presented on this website.